A cover letter is frequently required, and recommended, along with your job application. It expresses your interest in the role, sums up your qualifications, and attempts to show how you are different than the other candidates. A good cover letter doesn't tell an employer what you want from a job; it tells them how you will help them. It demonstrates the strengths and benefits you will bring to the position and how your past experience will make it a quick transition. Each cover letter you submit should be customized for the particular job description. Particularly when applying for a job in government, an individualized cover letter is essential. 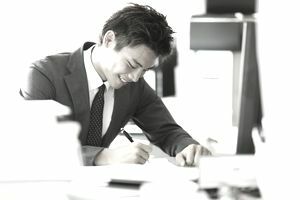 Government human resources departments frequently use computer programs to scan cover letters, and using keywords from the specific job description can help your application be recognized. What Should a Cover Letter Look Like? A cover letter for a government position would look like the below sample. Download the cover letter template (compatible with Google Docs and Word Online) or see below for more examples. I would like to express my enthusiasm in applying for the position as a legislative intern at the New York Civil Liberties Union recently posted in The New York Times. As a prospective May 2018 graduate from Boston College with considerable writing and administrative experience, and a strong interest in law, public policy, and immigrant rights, I believe I am a strong candidate for the legislative intern position. The job description states that you are looking for a candidate with a commitment to civil liberties, who has strong communication and interpersonal skills, excellent writing skills, organizational skills, and someone who is very detail oriented. As a government major currently involved in writing a thesis on immigration law and as someone who contributes regularly to several blogs focused on government and immigration issues, I have become a proficient and skilled writer. As a current intern and assistant to Tom Jones, Legislative Assistant for Attorney Bill Phillips, in New Brunswick, NY, I have further enhanced my quantitative and qualitative research, editing, writing, and administrative skills. As a government major, I have spent the past four years of my academic career focusing on U.S. immigration politics and immigrant rights. I have taken courses in American Politics, Immigration Law I and II, Dissident Political Thought, Politics of Congress in addition to conducting several research projects in collaboration with Professor Jack Barnes at Boston College. I have excelled in my academics and previous internships and jobs and feel that I would be an asset if I were selected to intern for the New York Civil Liberties Union. I will call within a week to discuss my candidacy and see if we might arrange for mutually convenient time in which we can speak. Thank you for your time and consideration, and I look forward to hearing back from you soon.